The 2016 Southeast Hay Convention is planned for March 8-9, 2016 at the Sunbelt Ag Expo grounds in Moultrie, GA. This event follows on the resounding success of our previous programs. This two-day workshop will focus on techniques for producing high yields of high quality hay and baleage, along with a more detailed look at specific topics. The agenda is provided in the Program Details at this link. How Will GA’s Rising Pecan Acreage Affect The Long-Term Market For Pecans? I can’t tell you how many times I have been asked about or heard someone comment on the great potential for the pecan market to bottom out a few years down the road thanks to all the new acreage being planted. Make no mistake, anything that goes up is bound to come down at some point. But just how far down do you expect pecan prices to fall? The answer to this question depends on your level of optimism. There are a number of things to consider in all this to truly make an educated guess about the future of the pecan market. Foremost on this list of considerations would have to be our export market, which is currently driven by China. China’s economy has many people concerned, but the Chinese demand for pecans has remained strong in the face of downturn in their economy. In addition, the fundamentals for long-term growth of the tree nut market, including pecans, in China are in place. There is an excellent article explaining the details of the optimistic outlook for the tree nut market in China available here: China’s Potential as an Export Market for Tree Nuts. The greatest unknown factor we face in the Chinese export market is our future political relationship with China. We all hope this remains strong, but if anything goes wrong, all bets are off. In addition to China, aggressive marketing of pecans is taking place in India, Turkey, and South Korea among others to help grow the world-wide demand for pecans. Another important aspect that many of the naysayers are probably not considering is the potential of the Federal Marketing Order for pecans, and the this impact for domestic consumption. Growers will be voting on the referendum probably within the next 3 to 6 months. Federal Marketing orders for pecan were attempted in the past, but none has had the unified support the current proposed program has garnered. If the FMO does indeed get voted in, pecans will, for the first time, have significant funding to launch a national marketing campaign on par with some of the other tree nuts, which have reaped great rewards with their own programs. This will allow the pecan industry to get the message out regarding the remarkable health benefits of pecans on a large scale, which is a necessity for increasing domestic demand. The other necessity for increasing domestic demand for pecans (and this may be the trickiest part) is a solid, consistent supply of pecans. Currently, we do not have the pecans available in the U.S. to develop as large and sustainable a market as we would like to see. This makes it difficult to coax large companies within the food industry to develop, produce, and market products using pecans as ingredients. I hear people constantly groaning that when all these trees we’ve planted come into production, we won’t be able to give pecans away. If we continued down the same path of marketing our crop as it has been done for the last 100 years, they would be correct. But, the fact is, we need the increased production to develop the market we need for pecans. There will likely be growing pains along the way, as we try to balance increasing the demand for the crop with increasing our production. But this is a good problem to have. And what about the increasing acreage? Just how much is it increasing? And what does this mean for the future volume of pecans produced? Other states are planting pecans, but from what I hear, probably not at the scale Georgia is planting. Let’s look at Georgia to illustrate this point, since Georgia produces about 30% of U.S. pecans. It is extremely difficult to pin down exactly how many acres of pecans we have because of orchard turnover, new plantings, unclear distinctions between managed and hobby orchards, and the complications brought about by the proliferation of yard trees and their inconsistent production. All this makes Georgia’s pecan acreage virtually impossible to accurately determine. The most recent U.S. Census of Agriculture (2012) placed Georgia’s pecan acreage at 123,415 acres. That same year, the UGA Farm Gate Survey accounted for 163,933 acres. So, lets shoot for somewhere in the middle and say we have 140,000 producing acres. We tend to average somewhere around 95 million lbs of pecans annually. If you do the math using the 140,000 acres that’s an average of only 678 lbs/acre. (This number obviously takes into account production from hobby and non-managed orchards.) 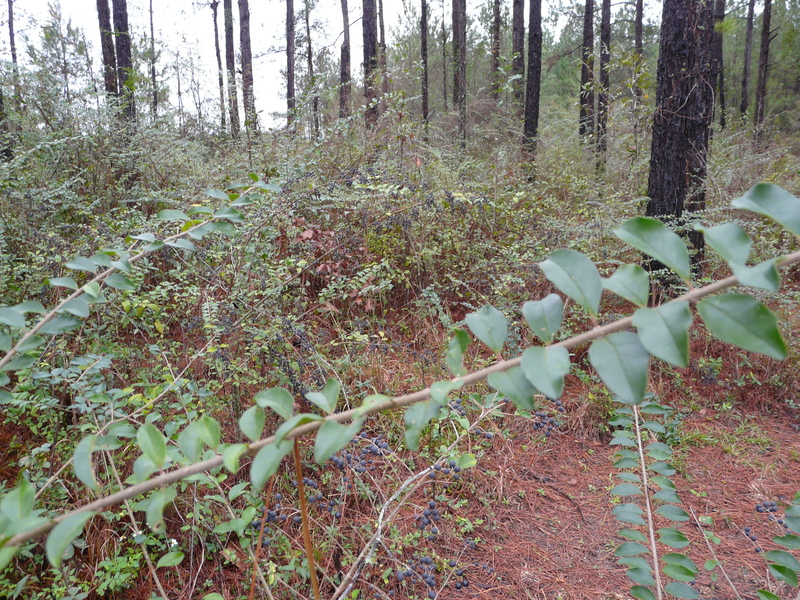 Commercial producers in Georgia produce much more than this—usually close to twice that amount—but this brings into question, just how many of these trees being planted now will contribute significantly to future production? Our survey estimates indicate somewhere around 20,000-25,000 new acres have been planted over the last 5 years in Georgia. At 678 lbs/acre, that’s only another 17 million lbs, which would bring us up to an average annual production of 112 million lbs. With a growing market, I don’t think this number is any a death toll for the pecan industry. We need this production to develop the market we are striving to have. 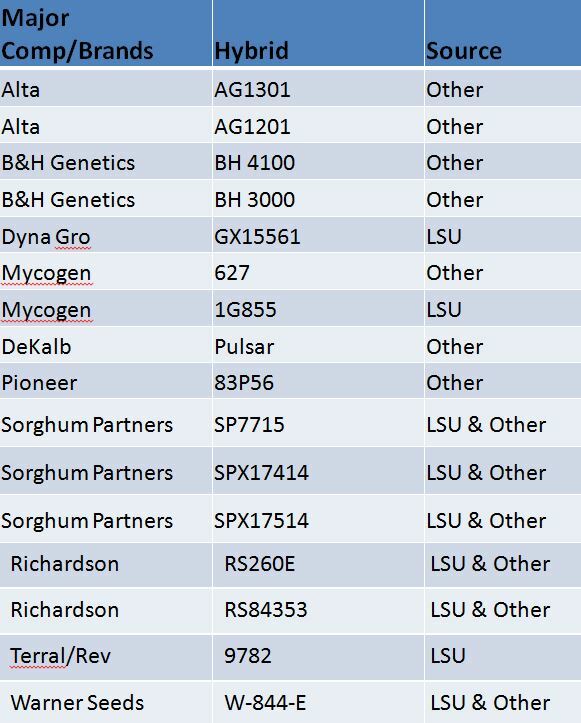 The varieties below were researched by UGA Extension Entomologist Dr. David Buntin and researchers from LSU or Texas for tolerance/resistance to sugarcane aphids. Remember, no variety is completely resistant to sugarcane aphids. For us in South Georgia, planting with a seed treatment is still advised. Grain sorghum should also be scouted for sugarcane aphids within two weeks of emergence. The good news is sugarcane aphids do not overwinter in Georgia. But we have to look for them within 2 weeks of planting, especially if we don’t have a seed treatment. All the females are born pregnant, and they have a very high reproduction rate. They are also not known to transmit any viruses. Dr. David Buntin: Upon evaluation of all grain, silage and forage sorghum entries in the GA state variety trial for SCA resistance/tolerance, DKS 3707 was the most resistance. However, none of the entries were highly resistant. There was very little resistance/tolerance in the silage and forage types. Threshold: Treat when 50 or more aphids are found on 25 percent of the crop. Sivanto 200SL @ 4 – 10 oz, (21 d PHI); 2ee for 4-7oz. Transform @ 1.0 – 1.5 oz, (14 d PHI); IF Section 18 approved for 2016. Chlorpyrifos @2 pt (60 day PHI), ? Efficacy, 7-10 days. Dimethoate, Lannate, malathion & chlorpyrifos @ 1pt are not effective. Pyrethroids are not effective, because they flare aphids. 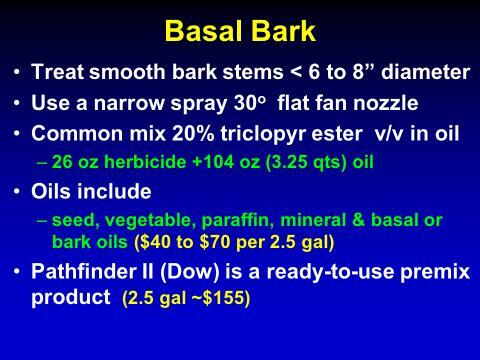 Add neonicotinoid seed treatment if available. Start with Sivanto, follow with Transform (if available) to rotate chemistries. Transform for harvest infestations (14 d PHI). 2015 research showed adjuvants have little benefit. No chemigation for Sivanto or Transform. No labeled insecticides for sweet sorghum! This conference is for both commercial and small farm growers. Growers can waive the late registration fee with the discount code farmone for a total fee of $49. 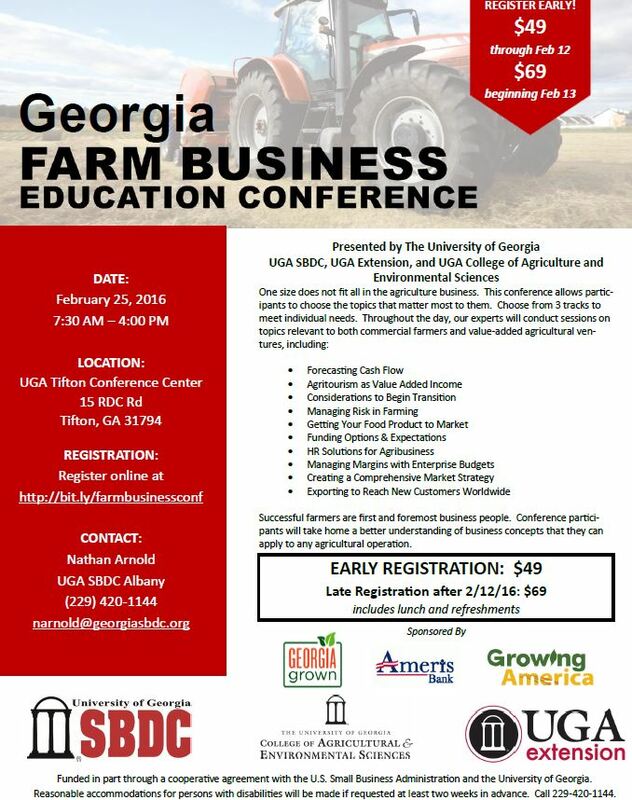 Registration is online here: http://bit.ly/farmbusinessconf. This is the time of the year when we think about burning and herbicides use when we are trying to clean up hardwoods in pines. When we are preparing to burn and not enough fuel on the ground, we may need to treat individual trees. This past week, I’ve had discussions about wide-spaced injection techniques and basal bark techniques. When we have larger diameter trees, greater than 6″ diameter, we use this technique called hack and squirt. All you need is a small hatched and spray bottle. 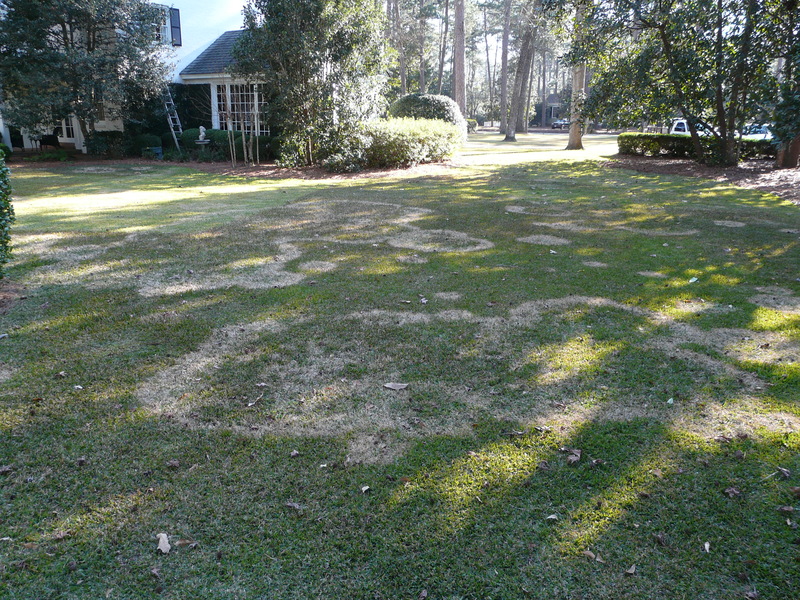 Imazapyr and triclopyr are commonly used for herbicides which are mixed with water. Depending on concentration of herbicide in solution is how many cuts we make in the tree. If 25% Arsenal AC or 50% Chopper is used, make 1 cut into the stem for each 3″ of tree diameter. (A 3″ diameter stem will receive 1 cut while a 6″ diameter stem will receive 2 cuts.) The cut goes right into the outer bark of the tree. You spray the solution into each cut. 1) What is Inzen Z herbicide-tolerant grain sorghum? 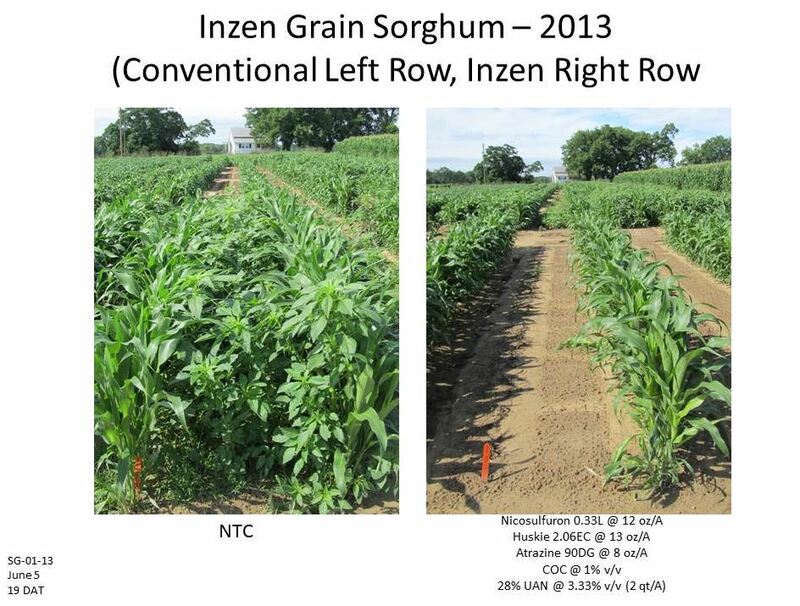 Inzen Z herbicide-tolerant grain sorghum is sorghum that has been traditionally bred (i.e. NON-GMO) for resistance to certain ALS-inhibiting herbicides. This technology was originally developed by Kansas State University and licensed to both DuPont and Advanta Seeds. The resistance to these herbicides came from ALS-resistant shattercane, a close relative of sorghum. 2) What is Zest herbicide? Zest is a new liquid formulation of the active ingredient, nicosulfuron. You may recall that nicosulfuron is the active ingredient of the old corn herbicide sold under the trade name of Accent. Nicosulfuron is also an ingredient of several other corn herbicide pre-mixes such as Steadfast Q (nicosulfuron + rimsulfuron) and Revulin Q (nicosulfuron + mesotrione). The use of Zest herbicide on conventional grain sorghum varieties will result in severe crop injury/death (Figure 1). At the time this blog was penned, a Zest label was not yet available. The official Zest label is anticipated in April? Figure 1. Weed control in Inzen Z grain sorghum with nicosulfuron in 2013. Conventional sorghum variety in right picture was completely killed by nicosulfuron. 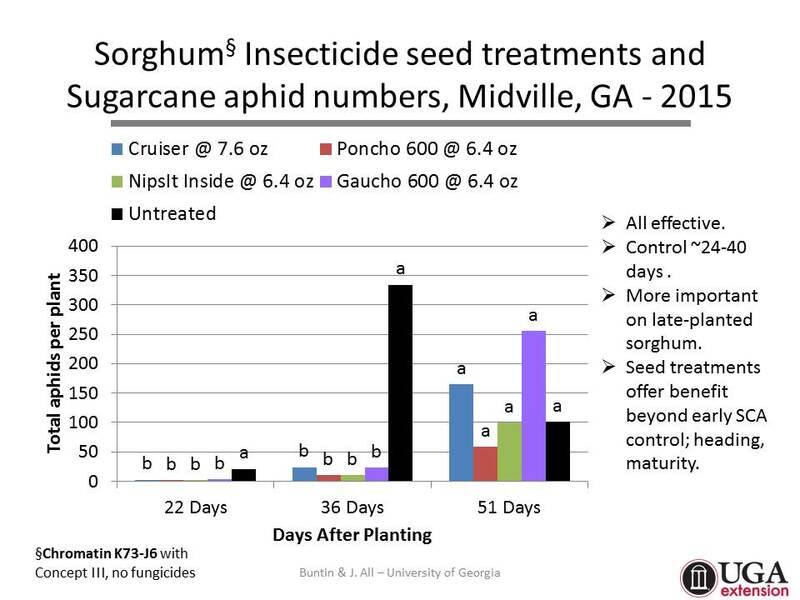 3) Has the Inzen Z herbicide-tolerant sorghum been tested system in Georgia? Yes! UGA weed scientists have worked with this technology for several years. When available, it will be very beneficial for grain sorghum growers who struggle with Texas millet/buffalograss control. However, resistance management will be crucial to the long-term viability of this technology. Georgia growers will be encouraged to start clean, use a residual herbicide at planting (Dual or Warrant), tank-mix atrazine with the POST application of Zest (Figure 2), and rotate crops. Figure 2. 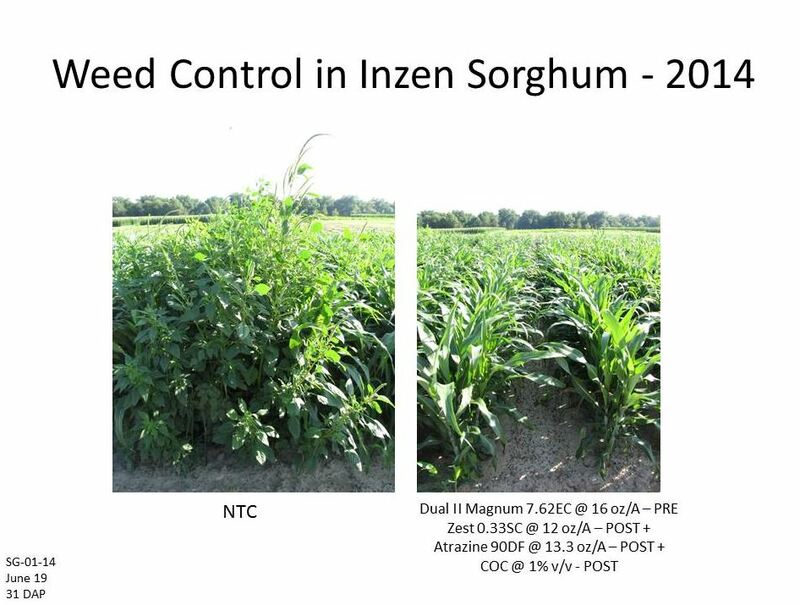 Weed control in Inzen Z grain sorghum – 2014. 4) Will Inzen Z grain sorghum hybrids be available to Georgia growers? Since Georgia is not a leading producer of grain sorghum (only 50,000 acres planted in 2015). 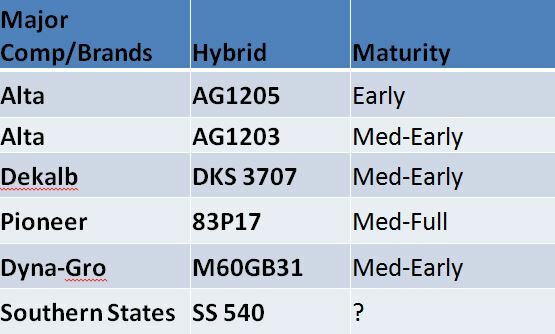 I expect our growers will be on the end of the list in terms of getting hybrids that are well-adapted to our region. In 2016, Advanta (Alta Seeds) is scheduled to release one Inzen Z hybrid to a small group of growers in Kansas and Texas. In 2017, Advanta hopes to launch an additional two Inzen Z hybrids. Pioneer will potentially launch in 2018.